About a year and a half ago, I thought I would change this site into an IT blog. That was before I knew just how much effort it takes when running a one man IT shop. Now I'm catching up. For the majority of my IT career, I worked for large corporations like General Mills, AT&T, Lucent Technologies, SunTrust and Lockheed Martin. Even smaller operations like the Greater Orlando Airport Authority or Career Education Corporation still had a team of people working on their Information Technology. When I started working for an employer last year, I found myself running a one man IT shop. The business had new owners who wanted to grow the business. Unfortunately, the previous owners seemed to operate by the notion that every dollar they didn't spend was a dollar in their pocket. That meant the IT operations were run on less than a shoestring budget. Here's an example of what I initially discovered. At some sites, the network crashed multiple times per day. Quite simply, the LinkSys routers couldn't even operate at the speed of the cable modems in some places. Let's add one more complicating factor. Each site has a couple dozen computers loaded with Faronics Deep Freeze software. That software keeps an image of the state of the computer at the moment you freeze it. When the computer reboots, everything resets to that point. Therefore, software updates aren't kept on the system if you fail to Thaw the computers, apply the updates, and then freeze the computer in the new state. The previous owners never updated those computers, so the result was a constant battering of the network. Faronics Deep Freeze comes with a central management utility that works very well…if you use it. The previous owners didn't use it. Instead, you had to manage each computer individually. Add the daily issues of support along with these issues and you can see why I haven't written in such a long time. 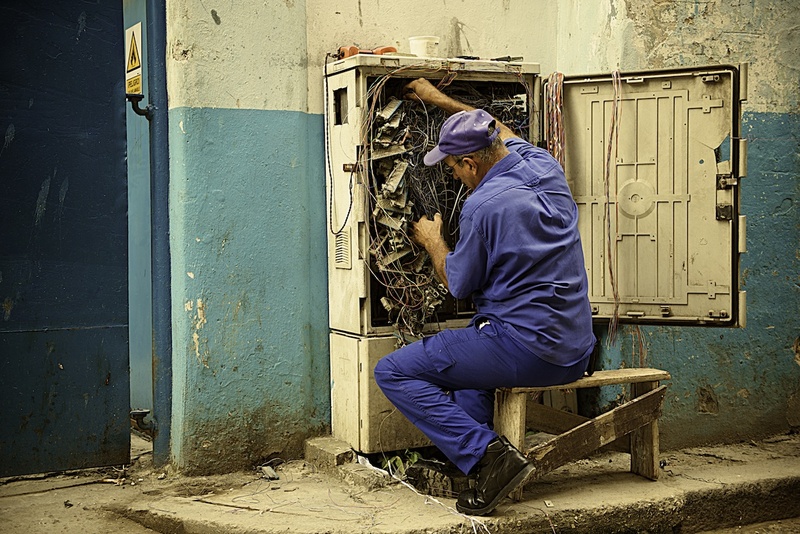 I was too busy crawling out of the stone age and I felt like this guy working on a telephone system in Havana. Fortunately, the new owners and management wanted a better environment and they approved some fundamental changes. I knew what needed to happen, and I also knew that I had no team to assist me. Everyone else in the company faced their own challenges and issues to correct. The key to running a one man IT shop is having an ability to learn anything. It's better to be a jack of all trades because you never know which issue you'll face next. Learning complex technology while putting out fires can take time, though. That's why it's important to develop good vendor relationships to bring in experts in key areas at the moment you need them. Finding a good vendor is challenging. Some live off their brand reputation instead of their capabilities. I found myself running into that problem with a major technology seller and finally had to cut them off. Fortunately, that change lead me to a smaller vendor on the other side of the country and they've been an excellent partner. Instead of keeping product specialists and AD experts on salary, I can draw on them as needed. Another critical component of the foundation is management support. You simply cannot transform an IT environment without supportive management. I'm lucky to have a manager who told me that he trusts me and has allowed me to use my judgment to improve the IT environment for everyone in the company. Finally, you have to want to do the work. Despite the frustrating problems, I really love what I do. One by one, I've watched the problems disappear. It could have happened faster with a team of people working on the issues without interruption, but the cost would have been outrageous for a small organization. One good thing about running a one man IT shop is that it allowed me to develop a vision that suited the needs of the organization and gradually implement solutions that fit, rather than hiring a team who planted a cookie-cutter solution that wasn't designed for the business. If there's a benefit to the never ending task of running a one man IT shop, it's that you get a clarity of purpose. Everything is your responsibility, even some things that aren't really IT issues at all. It's an amazing opportunity to gain experience with a multitude of technologies and business processes. I've also realized that this is far more common than my past experience would indicate. After all, there are plenty of small and medium sized businesses operating much the same way. That's what motivated me to return to writing on this site, particularly from the small and medium business IT perspective. I've been through a lot and hope to share what I've experienced along the way. With any luck, it'll help someone out there going through the same thing. Even when you're running a one man IT shop, you are not alone. It is refreshing to find a website, where I can identify with someone who walks in the same shoes I wear on a daily basis. I’ve NEVER been a one-mand band in an IT gig, so I had no idea how sprawling the issues were and how much energy, patience, frutration and ginormous chunks out of my life that this experience would require from me. the level of responsibility and autonomy available to me is indicative of the amount of trust afforded to me. I do a bang-up job, no doubt of that. I took a network that was one event away from total data corruption, or critical systems failure and within one year managed to reverse 90% of the damage caused by individuals with system admin skills posing as network engineers and AD architects. My IT is my Kung Fu…and it is strong. 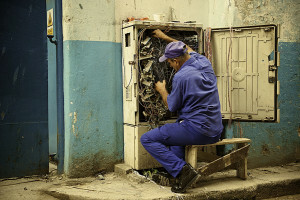 My faith in God, LOTS of prayer and good solid application of IT best practices, resourceful engineering and a blank checkbook (for the most part) allowed me pull this network from the 20th century abyss into the 21st century and into a world of efficiency, order better user experiences. But boy did it cost me. Wish I knew about this site, while I slaved away working 80 hours a week for 11 months straight. Look forward to reading more of your blog. Happy New Year to you and your company.